CGC 9.2 X-FORCE #23 .. DEADPOOL APP .. DOMINO APP .. 1993 ..
X-Force #23 (Jun 1993, Marvel) 9.4 NM PGX (like CGC) Deadpool cover/app. 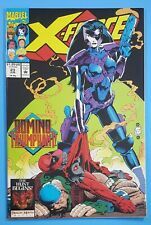 X-FORCE #23 DEADPOOL * DOMINO MOVIE MARVEL 1993 NICE!!! X-Force Comic Book # 23 1993 Marvel Comics Domino Deadpool! This page was last updated: 20-Apr 03:54. Number of bids and bid amounts may be slightly out of date. See each listing for international shipping options and costs.